Behold & Reflect: Book Bargain: Roald Dahl's "More About Boy"
I don't normally buy reading material at Dollar Tree, honestly. But over the weekend, I saw Quentin Blake's familiar illustration style peeking up behind a stack of generic inspirational books and stepped in for a closer look. 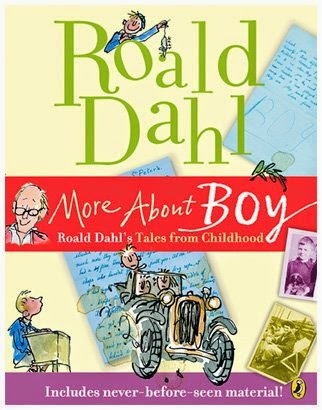 More About Boy, tales from the interesting life of Roald Dahl (1916-1990), author of James and the Giant Peach, Matilda and Charlie and the Chocolate Factory. The book's list price is $15.99, but it's selling for a buck at the dollar store! Much more interesting than an autobiography, this 220 page paperback is like Dahl's scrapbook of his childhood and budding aspirations as a writer, filled with black and white photographs, maps, snippets of letters and stories in the author's handwriting and Blake's silly scratchy sketches. I read the first chapter while eating breakfast and look forward to sharing it with my oldest son as a way to inspire him to work hard and pursue his interests.